Like they say, Happy Wife means Happy Life. But what keeps an overworked housewife happy in a city like Mumbai where even breathing sometimes becomes a chore? Ask me. With responsibilities of running a house whilst managing a full time job in addition to looking after a young child, vacations seem an impossible task to plan. So what does the poor hubby do? He plans a vacation within the city, to enjoy all the perks of ‘being on a vacation’ without having the hassle to ‘plan the details to a T’. It’s a growing trend among young urban couples to take ‘staycations’ to enjoy the luxury of a holiday while managing the increasingly hectic work schedules. I believe it is a perfect way to embrace the work-life balance that has been missing. After all today ‘Time is Money’ and it is no longer an option to disconnect and take off from work to escape into a gateway. And thus a holiday within the city is a welcome change not only for the relaxation but also quality time with loved ones. In the bustling city like Mumbai staycations are very popular and thus practically all hotels are offering various packages to clients who wish to experience them. There is a huge market to be explored and everyone wants a pie of the growing trend. 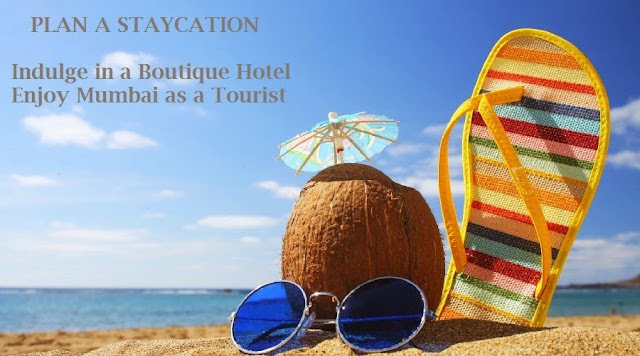 Personally I love staycations and having experienced a few, I love the ones offered by boutique hotels in Mumbai. Tailor making a bespoke experience, keeping the essence of luxury intact while indulging in the comfort of the know city enables these boutique hotels to offer clients a short and effective sojourn to break free from the mundane. Not only are these pretty reasonable and affordable but the personal touch and a knack to please sets them apart from the routine experiences. Some of the ones I really wish to explore are the Hotel Dreamland that’s bang in the middle of the city, Hotel Godwin that’s downtown and Vits Hotel that’s in the commercial hub of the city. Hotel Bookings in Mumbai are very convenient and easy as well with multiple ways through online travel websites or the directly via the hotel website or through agents who have some amazing packages to offer. However in the time when you want give the mid-segment hotels in Mumbai a miss and indulge in some really luxurious mini-vacations you can opt for some set staycation packages offered by top notch hotels as well. But whether or not you book your staycation this summer, make sure you ensure you have every product in your wardrobe from our summer essentials guide. Do you think staycations are a good idea? Have you experienced one? thanks for the tips! I'll save these article for future travel. its not very popular in my city but staycation is a great idea! !